The skyline o dountoun Fargo as seen frae Main Avenue, facin north. 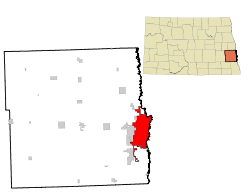 Fargo is the lairgest ceety in the State o North Dakota, accoontin for nearly 16% o the state population. ↑ "Population Estimates". United States Census Bureau. Retrieved May 21, 2015.